KAMPALA. The dramatic events on Tuesday’s Kyadondo East by-election campaign D-Day continued with a woman motorist in wild date with fate when angry supporters of Bobi Wine threatened to lynch her for allegedly knocking people in a procession. 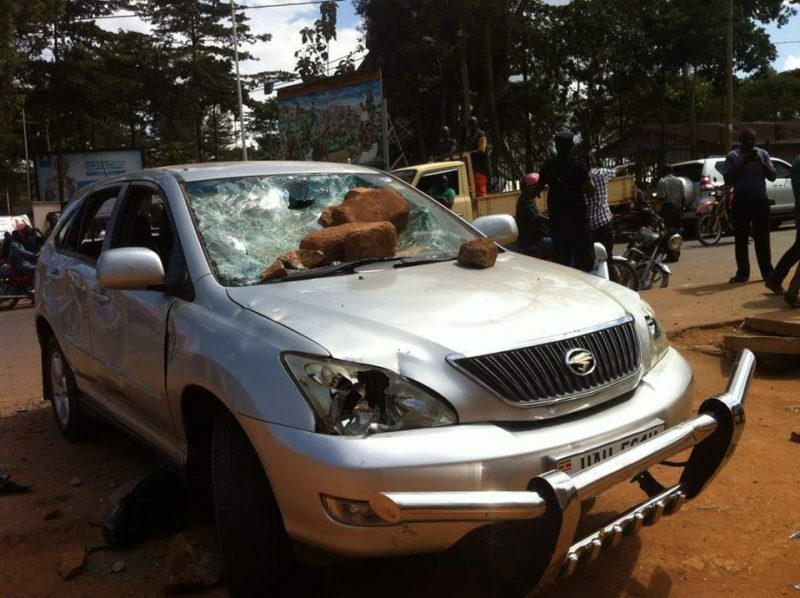 According to accounts on social media a woman driving a Toyota Harrier UAU 501H was involved in a road rage and tried to drive into supporters of Bobi Wine around Kiira Road Police Station where the independent candidate had earlier been detained only to end up hitting two boda boda cyclists. Sources say the woman then drove off but boda boda cyclists gave chase, catching up with her around Namugongo and unleashing a flurry of stones on the car. A Police officer at Kiira Road Police Station was by press time yet to revert after initially saying he would call back. However, sources say Police had to intervene and shoot in the air to disperse the angry boda boda cyclists who were threatening to lynch the motorist. Dramatic events surrounding Tuesday rallies for the three top guns in the Kyadondo East parliamentary by-election started hot at Kasangati Saza Ground where Robert Kyagulanyi, an independent, was scheduled to address a rally. Police could have none of it, however, and moved to disperse his supporters from the venue. Bobi Wine stood his ground and in the ensuing melee, he was dragged to Kasangati Police Station and later whisked off to Kiira Road Police Station. 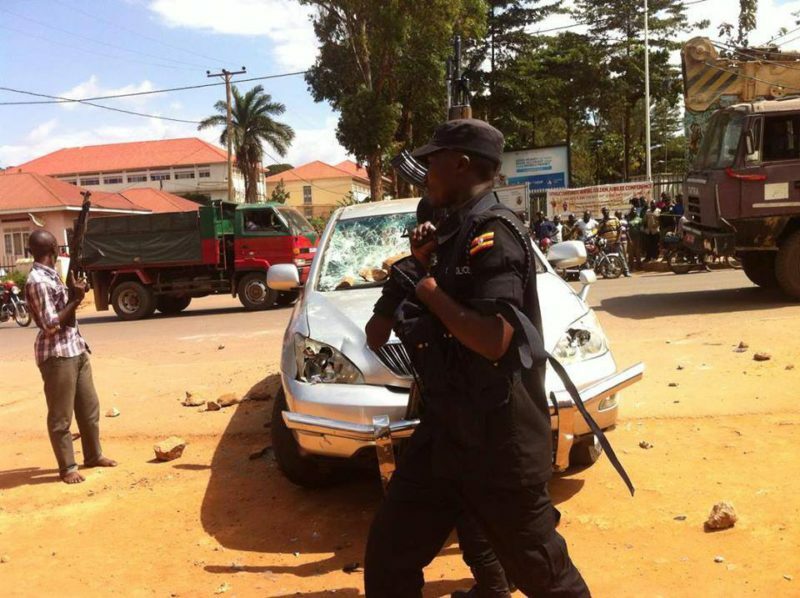 The incident received wild coverage given Bobi Wine’s celebrity status with mainstream media and social media momentarily forgetting that President Museveni was due to address a rally and was the reason Police wanted Bobi Wine out of Kasangati where they said was too close to Wampewo where Museveni was scheduled to campaign for Sitenda Sebalu of NRM. Led by Samuel Walter Lubega, a former presidential candidate, Bobi Wine’s supporters hit the ground for Kiira Road, besieging the Police Station until the singer-turned politician was released. Meanwhile, FDC candidate Apollo Kantinti, who had abandoned his scheduled rally to protest arrest of Bobi Wine, moved to claim Wampewo, insisting NRM had no right over the venue. Bobi Wine has since moved to Gayaza to address his last rally as FDC led by Kizza Besigye had taken over Wampewo, pushing NRM away. As more drama unfolded, Police arrested NRM’s Sebalu for illegally holding up space at Wampewo, which was not his designated rally venue. NRM has since moved to Kabubu to avoid a confrontation with FDC.